When I was more serious about photography, I used to spend hours and hours in darkrooms and ran around Dublin in chemical splattered clothes. Although, I'm an average photographer, it was the most artistic I've every felt. Every spare penny went on camera film or exotic fibre-based paper and every lunch break was used to make photographs or replenish or process my film supplies. 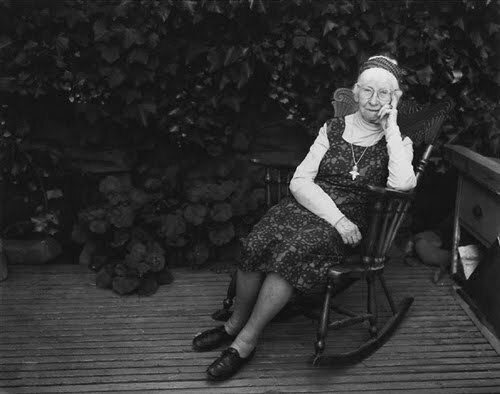 I worshiped Imogen Cunningham. This photograph, in particular, created such a profound impression on me that I photographed my unmade bed every morning for weeks. Portland-born Cunningham not only inspired because of her talent but her work ethic. She subsidised her education by taking photographs of plants for her university's botany department and won a scholarship to study chemistry in Germany. Botany remained one of her favourite photographic subjects, but she also had a keen interest in the human form, from hands to nudes and in street photography. I like what Cunningham says about not hunting, making mistakes and being unable to self-evaluate in this video. And I like hearing her voice, it always slightly alters what I think of somebody, grounds them in reality I guess.